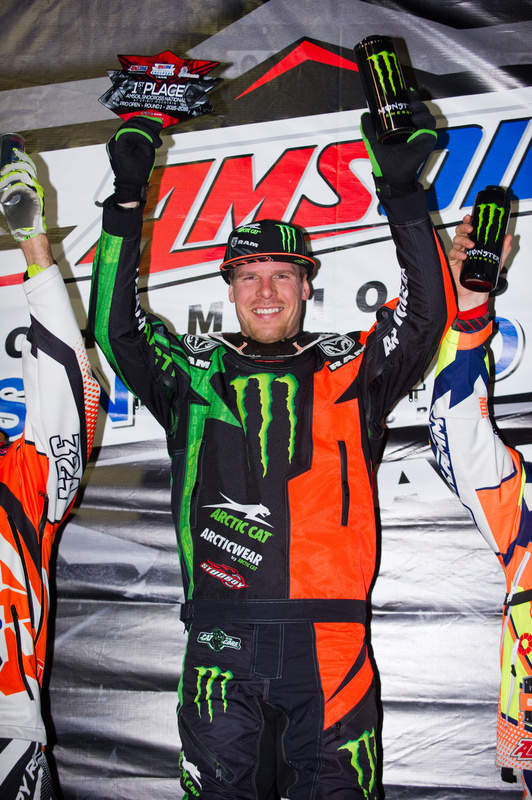 Monster Energy / Arctic Cat / Ram Truck’s Tucker Hibbert secured the ISOC National Snocross Pro Open points championship lead with a win at the 2015-2016 season opener in Duluth, Minn. The nine-time champion put his experience to work with a solid win Saturday and heart-pumping race through the pack Sunday. In front of a maximum capacity crowd, Hibbert pulled off a big win Saturday night. A fifth-place start in the Pro Open final forced him to push hard in the opening laps on Spirit Mountain ski hill’s icy, rough track. Nine laps into he 20-lap, 15-rider final, he made the move on leader no. 324 Kyle Palin and pulled away for the win. It marked his fifth consecutive Duluth National Pro Open victory. After a weekend off, the ISOC National Snocross tour returns to action at Buffalo River Race Park in Glyndon, Minn. December 11-12. For more information on Hibbert and his schedule this winter, visit tucker-hibbert.com. With a proven crew and sponsor line-up behind him, Tucker Hibbert enters the 2015-2016 season prepared to defend his ISOC National Pro Snocross title and continue his gold medal win streak at X Games Aspen. For the tenth consecutive year, Hibbert will ride for and operate Team Monster Energy / Arctic Cat / Ram Truck. Alongside a trusted crew, he continues to oversee everything from team personnel to marketing while serving as the team’s sole rider. New to Hibbert’s program are crew members Dan Ebert and Ashley Rambow. Both Ebert and Rambow most recently worked with Team Arctic’s factory snocross team. Ebert is already working with Hibbert’s father and crew chief, Kirk, on the development and tuning of race equipment. Rambow will assist with the team’s marketing and promotional efforts. Long-time partners returning to Team Monster Energy / Arctic Cat / Ram Truck include: Arcticwear, Stud Boy Traction, Fly, Speedwerx, FOX, Leatt, Hot Stuff Pizza, C-Tec2 Synthetic Oil, TekRider TekVest, Kicker Audio, Digital Ink Design & Graphics and CTi. As announced earlier, Bosch Power Tools joins the fold as the official power tool of Hibbert and his team. Hibbert kicks off the 2015-2016 season next weekend at Spirit Mountain in Duluth, Minn. at the 24th annual ISOC Duluth National. For more information on him and Team Monster Energy / Arctic Cat / Ram Truck, visit tucker-hibbert.com. Team Monster Energy / Arctic Cat / Ram Truck Crew Members: Kirk Hibbert, Robby Dahlen, Dan Ebert, Mandi Johnson, Kevin Krocak, Luke Perreault and Ashley Rambow. Noteworthy: Hibbert is continuing signature product lines with both Arcticwear and FOX. 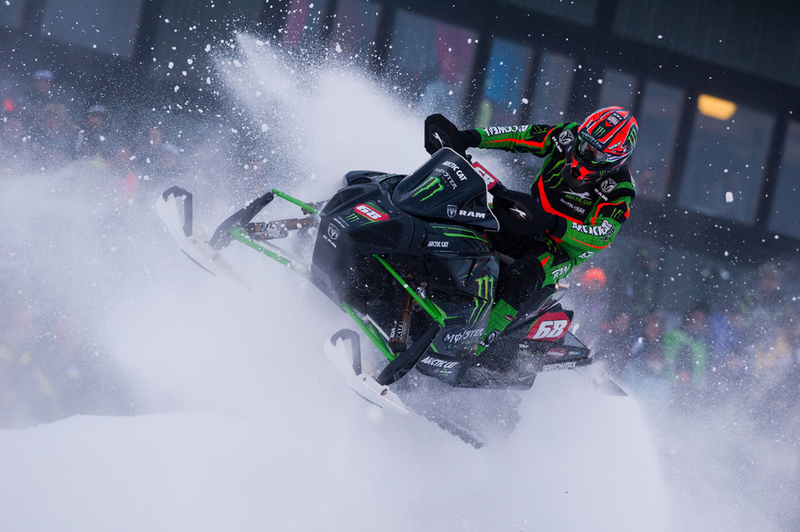 Every time Tucker Hibbert wins a final during the 2015-2016 snocross season, five people will win a prize pack that includes a pouch of Arctic Cat C-TEC2 Synthetic Oil and a 68 hat, both autographed by Hibbert. All you need to do is sign up once and you’re good for the entire season. With 18 finals on the line this winter – that means you get 90 possible chances to win with Tucker Hibbert!